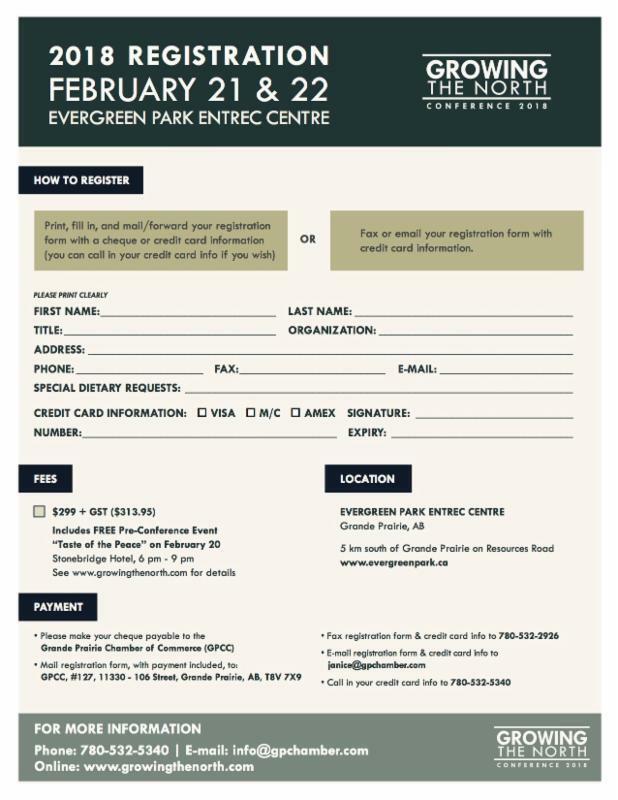 The 10th Annual Growing the North Conference is scheduled for February 20-21, 2019 in the Tara Centre at Evergreen Park, which is located five kilometres south of Grande Prairie on Resources Road (Visit evergreenpark.ca for more information). Keep checking this website for updates on the 2019 Conference including schedule changes and confirmation, speaker lineup, hospitality options, and sponsors. The cost is $299.00 + GST. For a complete list of presenters along with their profiles as well as the conference schedule visit growingthenorth.com. There is also ample time for networking to build and renew relationships with fellow delegates. Also included in your registration is a FREE pre-conference event on February 20, 2018, Taste of the Peace (facebook page), highlighting local growers, producers and food/beverage industry representatives on February 20 at the Stonebridge Hotel (hotel website click here). *You do not have to be a registered delegate of the conference to attend Taste of the Peace. Please visit the website growingthenorth.com for more information on the 2018 Conference. For sponsorship information, please contact Cindy Simigan at 780-532-5340 or cindy@gpchamber.com. For registration information, please contact Janice Chomik at 780-532-5340 or janice@gpchamber.com or click on the image below for a printable PDF.